At once delicate and severe, Sasanqua Link’s Corporeal Relics series explores how the meaning of the vulnerable human body reacts and transforms within clinical environments. Constructed primarily of beeswax and stainless steel, the Relics series presents fragmented pieces of the human body confined in metallic encasements against a background of bare white tiles. Exquisitely constructed, the pieces demonstrate Link's background as a jeweler and metal smith. 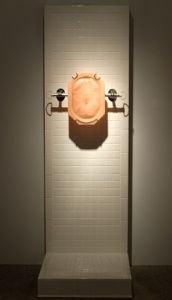 The gleaming metal rods and cold white tiles contrast with the warmth of the sculpted ‘flesh’ they contain. The sterile examination room references are intentional, meant to evoke a clinical experience. Glowing within these stark spaces, the flesh exists as a visual phrase, reaching out to the viewer and asking them to relate.